I swear I'm not intentionally featuring bites that are vaguely coprolitic in appearance, but I admit there's been a pattern lately. 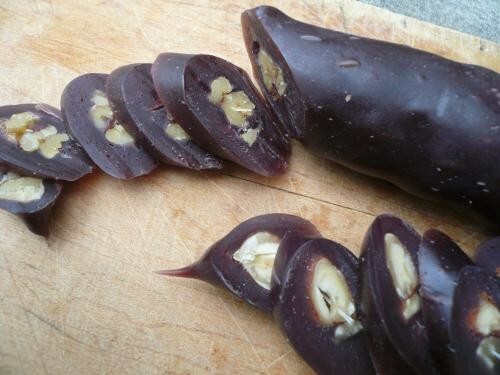 You have to wonder what sort of reaction you'd get passing out churchkhela at Halloween, but in the Caucasus no one bats an eye at these stringed, grape-enrobed walnut confections. Traditionally a byproduct of the grape harvest, they are made by threading nuts onto string, dipping them repeatedly in a paste made from boiled grape must, flour, and sugar, then hanging them up to dry. There are dozens of different varieties back in the old country, filled with all sorts of dried fruits and nuts, but at Argo Georgian Bakery they come with walnuts or hazelnuts, dipped and dried three times in a syrup made from good old Concord grape juice. At three bucks apiece, they are mildly sweet, with a texture like fruit leather.